Dog Gone Happy: Fantastic Weekend! Thank-you to the Nature's Variety vendor who took the above photos and emailed them to me! I didn't catch her name and she didn't sign her email, so unfortunately I can't thank her by name. UPDATE: her name is Michelle. :-) I have lots more photos and videos, but I'm still not at home, so I'm not able to edit them for upload till I get there. 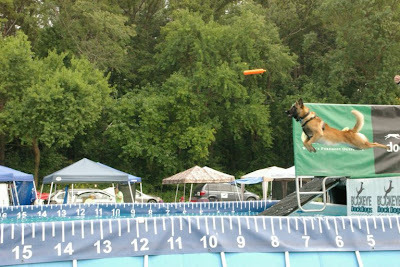 Dazzle entered his first official DockDogs event this weekend (as if you couldn't tell from the photos :-) and he did exceptionally well! Our goal was just to have fun because I know he loves doing it, but more on our surprizing results in a moment. It was a VERY hot and humid weekend (90 degrees plus high humidity and not much breeze), so I was glad we were at an event where Dazzle could stay wet and that I was told to bring a shade tent! Thankfully, the event was only 6 minutes from my parent's house because we needed to arrive at 7:30 to do a "day-of" event registration and those filled up fast! They reached their maiximum of 40 dogs entered, so there was plenty of great competition. There is a big dock diving club in that area, and I saw many people with that club's T-shirts and some I recognized from photos on their website. After getting our area set-up, we settled in to wait till the practice jumps. My biggest fear was that Dazzle wouldn't jump because he had never jumped into a clear pool before. He has only jumped into lakes and rivers where the bottom was not clearly visible. I have heard that it bothers some dogs to be able to see the bottom, I'm guessing because they can't see the top of the water. So it looks like the landing is much lower than it is! So when we did our first practice jump, I didn't let him go to the end of the dock where the pool was. As soon as he got up on the far end of the dock, I put him in a stay, walked to the end, released him and tossed the toy. He was concentrating on the toy and by the time he could see into the water, it was too late to stop :-) The practice jumps were not measured, but I know his first was a pretty short jump. He did slow down and try to stop at the end, but momentum carried him into the water. After that, he didn't have any problems with the jumping in. After his first jump, he did have some trouble finding the exit ramp. But once he found that, he was able to quickly get out after all other jumps. So I was confident I hadn't just wasted all the entry fees and we would have a fun weekend. I signed up for 5 "waves" meaning a total of 10 jumps. 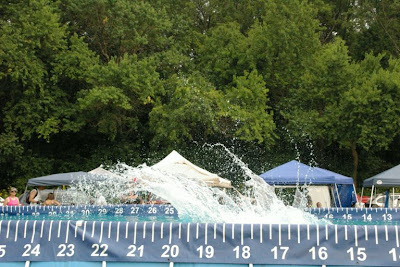 In each wave, the dog gets to jump twice and the best jump of the two is what gets entered into the record books. They break each wave into 4 groups of about 10 random dog/handler teams. The 1st group lines up in their running order and each dog jumps once, then they get back in line for their second jump. After all of group one has gone twice, then group 2 lines up and repeats the process. Our first wave, we were in group one, after that, we were in either group 3 or 4. The group has nothing to do with the dog's abilities, it's just a random order to make line-ups and waits shorter for the dog's actively jumping. His first official jump was 14' 5" which is at the top of the "Jr"? division (I think it's called Jr.) which is any jump from 1" to 14' 11". All his other jumps were near the lower end of the Senior division which is 15' - ?' 11". I just looked on the Dock Dogs website trying to find the different distances for each division, but didn't find it listed. His second jump of the first wave was 15' 7" so he was into the Sr. division and that's the distance recorded for his first wave jump and was good enough for 8th place in the Sr. Division. There was several hours between that wave and the next, so we went to check out the other activities at the Canine Fun Days event. 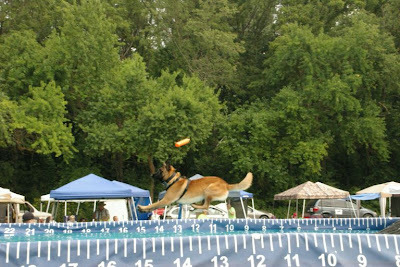 They had agility, "fear factor" which I didn't get more details on, lots of contests and games and the thing that caught my eye- an open lure course for any breed! I know he loves Lure Coursing, so I signed him up for a run. He got himself all worked up watching the dogs ahead of him, so we had to move away till it was his turn. He really opened up and was flat out running after the lure the whole way! Great big grin on his face :-) I tried to get some video, but I'm not sure if it's "watchable" from all the zoom issues I was having :-) I'll have to view it and see if it's worth posting. I tried to stay zoomed in on him, but at the farthest zoom setting, the camera is super sensitive to movement and I kept "losing" him in the view finder. The first jump of wave 2 was 16'5" so he added almost another foot over what he jumped this morning. 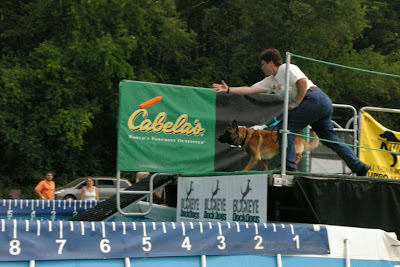 His second jump was only 15' 11" and I think it might have been because of a bad throw of his toy (possibly the one in the photo above where the toy is chasing him :-) We again placed 8th in the Sr. Division. 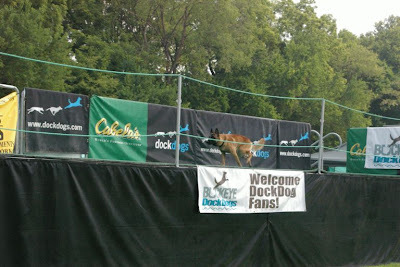 There were 40 dogs competiting and between 10-15 were in the Sr. Division each time. We both took a nap in the shade of the pop-up tent as we waiting for the 3rd wave. I was glad I was told to bring a lunch and snacks as well, since the food on site was typical "festival" food and was typical festival prices. I got there early again to get a good parking place in the shade (till near the very end of the day at least) just across the dirt road from our shade tent so I didn't have to lug Dazzle's crate out of the van today. He wasn't in it much, unless I needed to use the bathroom or go to the registration table. The rest of the time he was just lounging around with me under our tent. I definitely need to get a reclining lawn chair if we do more of these! His first jump was 15' even, so I really worked at getting his second jump bigger. It must have worked! He jumped 17'0"!! His longest jump of the day! They also had a person with a rader gun who said he came down the dock at 19 mph! Between runs, I made several new friends and enjoyed chatting with lots of people there. The folks next to us had a whole litter of chocolate lap puppies in a big pen and I enjoyed watching their antics as they played. I got an adorable photo I'll title "future dock diver" of a puppy sleeping with his head and front paws in his water dish :-) We had a nice view of the pool, so I was able to watch all the compeditors diving, some of which were jumping over 22'! Although it was really hot, it was a great time and I look forward to doing it again. I'll post the photos and videos as soon as I can. Mike says our DSL is down at home for an "indefinite time" because the cable co. doesn't know WHY it's down. So as soon as that's back up and I can get on-line, I'll post the great photos and videos taken by the new friends I made. thank-you to those who were kind enough to do that for me! I did get to meet Cindy and Fever, whom I knew only from a Malinois talk list and her dog was jumping big! I stayed around to watch her in the finals, but didn't stay for the official results. She thought she was either 3rd or 4th place. Way to go Fever! Thanks in advance for the photos you took of Dazzle too!